(Newser) – Russia was banned this week from the 2018 Winter Games; will the US ban itself? 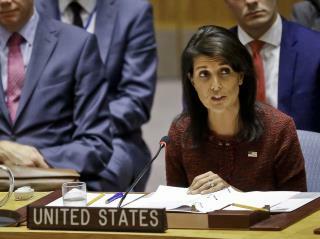 UN Ambassador Nikki Haley on Wednesday called Team USA's participation in the Games an "open question" in an interview with Fox News. The Washington Post reports that the Games will take place in South Korea, roughly 50 miles from the DMZ, and with tensions high on the Korean Peninsula, Haley was asked if it was a "done deal" that the US would attend. Her reply in full, per CNN: "There's an open question. I have not heard anything about that, but I do know in the talks that we have—whether it's Jerusalem or North Korea—it's about, how do we protect the US citizens in the area?" She should consult her coven. Put on the big boy/girl pants and tough it out, snowflakes. Really? So Russia invading Afghanistan .. BOYCOTT! But Kim threatening war on US .. we have to think about that and keep an eye on how capable all those missiles he keeps lobbing in our direction become. Really? We should be upstanding and proclaiming that the BOYCOTT of NoKo Olympics is a done deal until Kim stands down and destroys his arsenal. And by God, our so called 'friends' in the world better pick a side.